“Special Operations for America” must stop politicizing military insignia, US officials tell MoJo, or face possible legal action. When you set up a Swift Boat-style front group to accuse President Obama of stealing credit for the military’s valor, maybe it’s not the best idea to steal the military’s official logos in the process. “Special Operations for America,” a new super-PAC* endorsing Mitt Romney for president and ridiculing Obama over the Osama bin Laden raid, appears to have done precisely that. 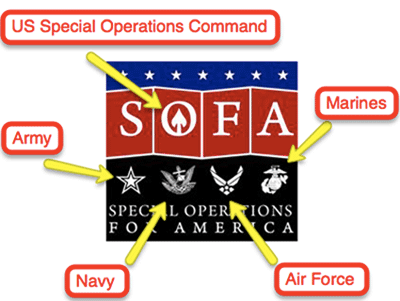 By using part or all of the insignia of the Marines, Air Force, Navy, Army, and the US Special Operations Command on its website, Facebook, and Twitter pages, the super-PAC has run afoul of military regulations, according to representatives of the US Marine Corps and Air Force who spoke to Mother Jones. “They don’t have permission to use the Marine Corps eagle, globe, and anchor in promotion of their service,” said Jessica O’Haver, director of the Marine Corps’ trademark licensing program, after inspecting the super-PAC’s website and checking her database. “We can’t appear to endorse them…We don’t currently license nonprofits and charities, especially if they’re promoting a political cause.” O’Haver added that since the super-PAC’s website includes marks from the other services, she’ll be contacting the DOD’s Trademark Office so that it can notify the PAC about its unauthorized use of the material. Part of that mission is firing away at President Obama for allegedly spiking the bin Laden football. “Navy SEAL’s, Special Operations Personnel and Veteran’s across America have been outraged since Barack Obama conveniently took credit for killing Osama Bin Laden for political gain,” writes Zinke. The headline on the press release announcing the group on Wednesday trumpeted Zinke as “Former Commander at SEAL TEAM SIX.” That seems a bit misleading: The unit, now known as DEVGRU, hasn’t officially been called SEAL Team Six since 1987, and Zinke once led subordinate units, not the entire SEAL Team. The group’s tactics are nothing new: They’ve partnered with the soft-money group Veterans for a Strong America and its leader, South Dakota political operative Joel Arends, who deployed a web ad back in May that blasted Obama for taking “so much credit for killing Bin Laden.” But “Special Operations for America” has now gone a step farther by wrapping itself in the US military’s official symbols. Correction: The story originally identified the group as a PAC rather than a super-PAC.